Because of my GUFF trip, I had to limit the time I take to attend conventions as I don’t have enough days of leave left, which is why I decided to take only one day off instead of two. The disadvantage of this solution is the fact that I arrived in Toruń quite late (just before midnight) and I missed the whole first day of the con. The next morning I was full of energy (and very sleepy ;)) and ready for the convention. 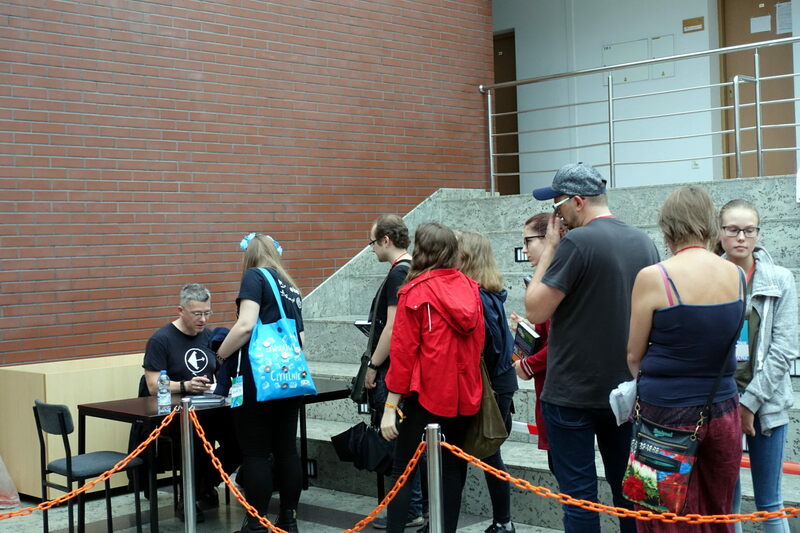 Rafał Kosik signing his books. I do remember my first Polcon, when I also arrived late, but I had a lot of time for programme. Now it is no longer so easy. I had an important task – I had to deliver the Dublin in 2019 promotional materials to our fantable. Then on both Friday and Saturday I had to spend some time at the table. Of course, it is fun to man the fantable: you meet people, you talk to your friends and friends of friends. 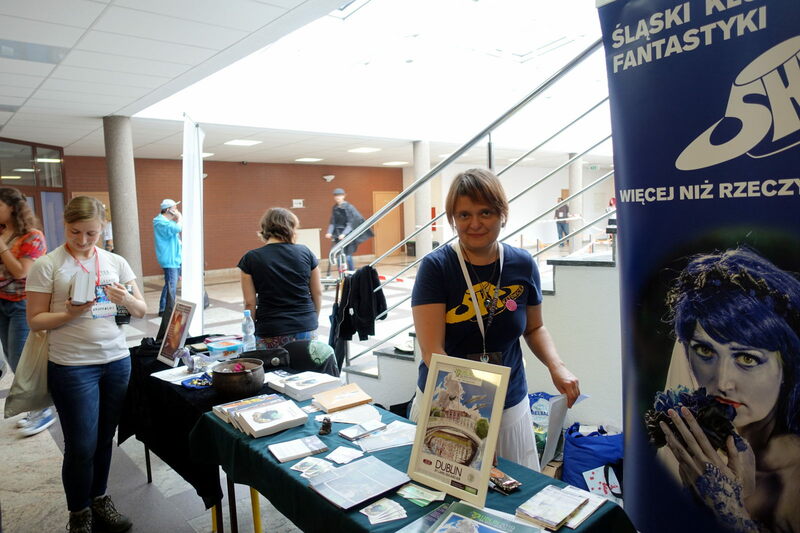 And you can talk about things you really like (including both Worldcon and Silesian SFF Club’s conventions and publications). Apart from that, there were some fandom-related meetings that I had to (and wanted to) attend (Council of Fandom and Fandom Forum) on both Friday and Saturday. I will not bore you with all the details of the meetings, but I think two things are worth mentioning. Fandom Forum needs to accept Guests of Honour for the next Polcon. 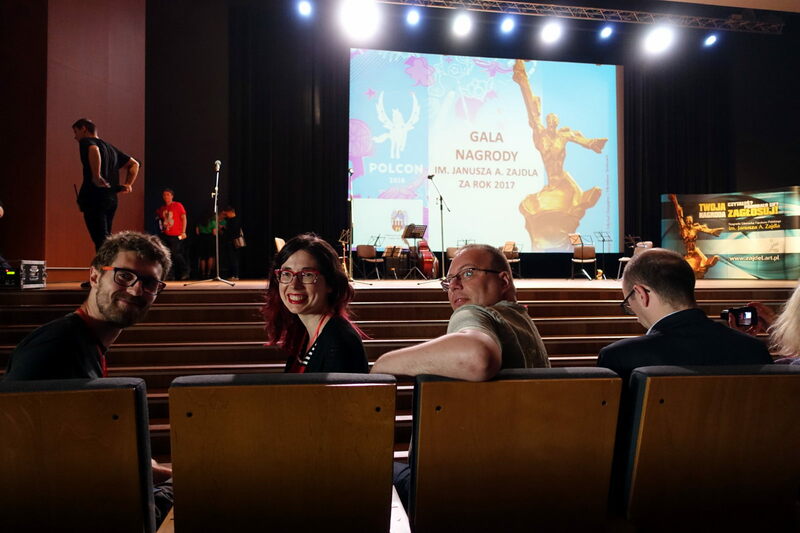 Usually, it’s just a formality, but this year one of the guests was rejected because of his past actions and words against Polcon and the Janusz A. Zajdel Award. 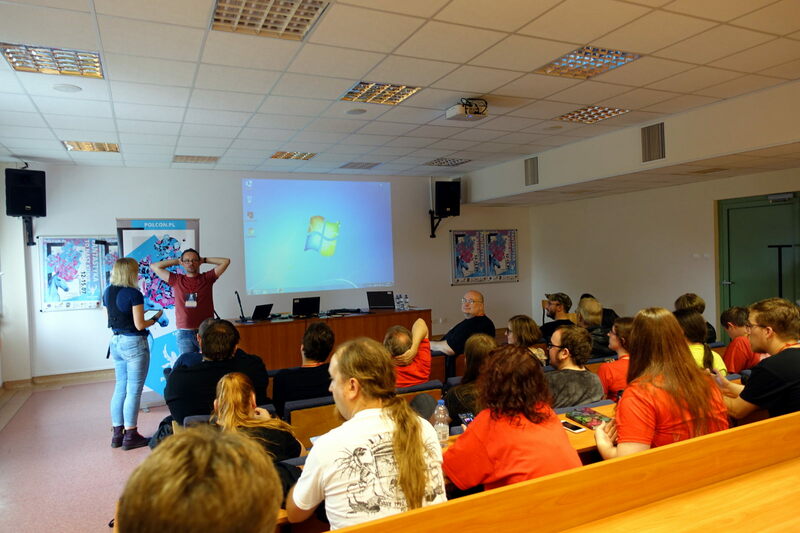 It was sad that the organisers of the upcoming Polcon in Białystok forgot about this matter. Fantable of ŚKF that I was manning. Then there is also one more piece of bad news. No one applied for running Polcon 2020. Fortunately, there is a team considering it, so we hope that we will be able to choose the 2020 organisers at the Fandom Forum at Nordcon in December. If this does not happen, one of the other conventions taking place in Poland will be selected to host the Janusz A. Zajdel Award in two years’ time. I really wish I had more time for the programme. Official duties aside, I wanted to spend at least some time with my friends. And a boy’s gotta eat some time! And because of that I managed to attend only a few items. The programme looked really interesting and I would have loved to listen to so many more of them… I attended a panel discussion on Ursula K. le Guin (and I was even added to it when I started asking about her children’s fiction) and I did listen to a panel discussion on representation in popculture (it was really interesting and eye-opening). Of course, there were few others, but those two were most remarkable to me. Panel on representation in popculture. 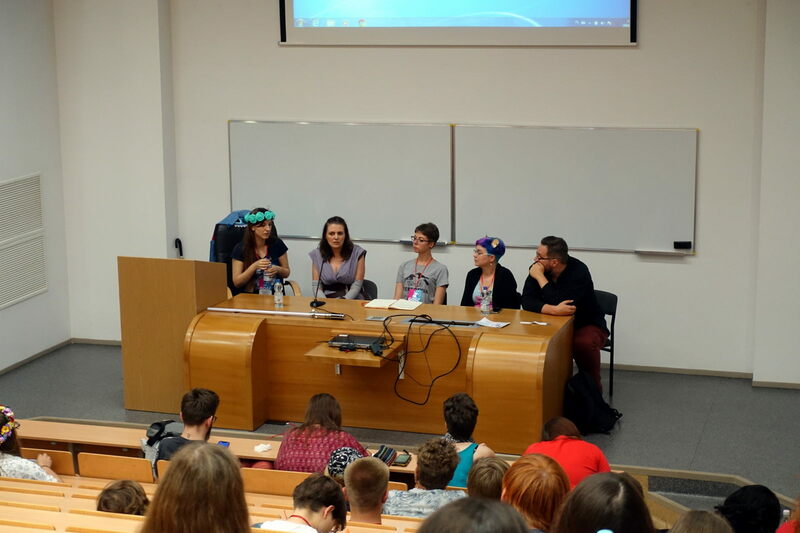 I missed some potentially interesting items about the Polish fandom and conventions, as well as some interesting literary and scientific panel discussions and speeches. 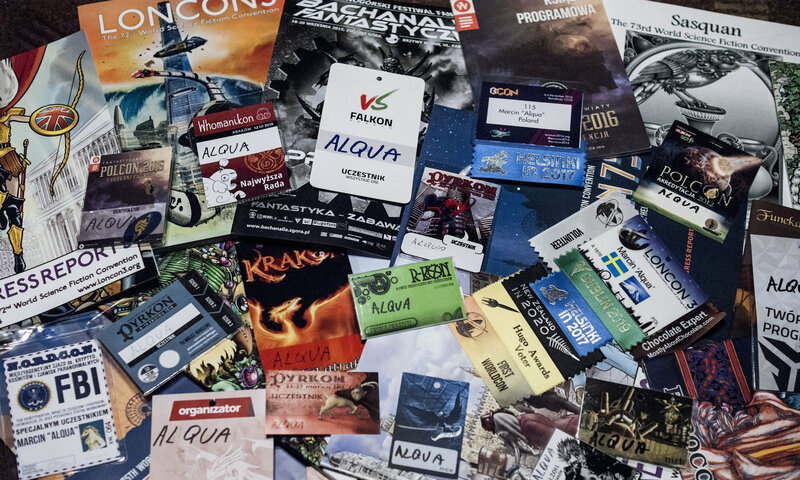 I hope to attend more programme items at future conventions, but it really depends on the scope of my duties. At the very end of the convention, on early Sunday afternoon, I had my talk about the GUFF trip. I was hoping to have it at a little bit “better” time, as many people already left the con, but someone has to have the last talk in a room and this year it was me. I should not judge this item as I was the presenter so I may only hope that my audience enjoyed it. Maybe someone got inspired and another person from Poland will run for GUFF in the future? This year’s ceremony of Janusz A. Zajdel Award was really nice. It was short and simple but at the same time it was just as it should be. The artistic programme included a mini-concert of the Heroes Orchestra. They started with music from Heroes of Might and Magic III (or at least something really similar) and later they played one of their own compositions. I am not a big fan of orchestra music, but this one I really enjoyed. Magdalena Kucenty (second from left) and Paweł Majka (third from left) – at the Janusz A. Zajdel Ceremony – both were this yer’s nominees. Afterwards, the winners were announced. 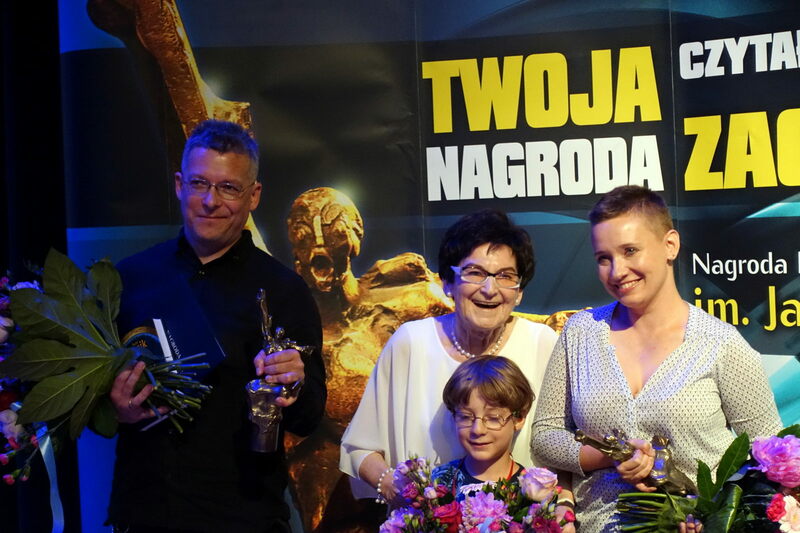 The award for best novel went to Rafał Kosik for Różaniec (Rosary) and the one for short story to Marta Kisiel for Szaławiła (no idea how to translate it). I must admit here that I didn’t manage to read any of the nominees yet so I’ll start with these two works. From left to right: Rafał Kosik, Jadwiga Zajdel with her grandson and Marta Kisiel. There was one more thing I enjoyed during that evening. 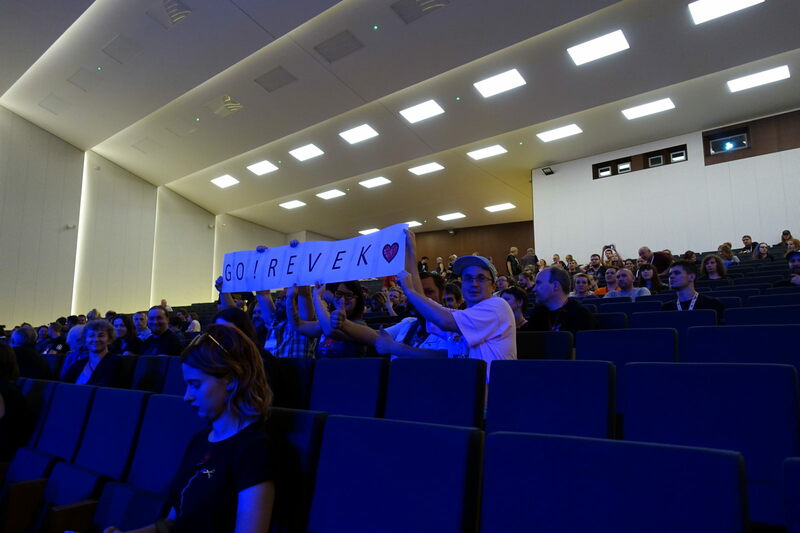 A friend of mine – Revek – was on stage during the ceremony. Why? For some time now the Polish Fandom Federation of Associations (something like “Polish” ESFS/WSFS) has been spending more money than raising. As it is the Federation who pays for the statuettes, we were looking for potential solutions to get more money in and when Revek heard that, he decided to donate money. His donation was spent on this year’s statuettes. Here I want to thank you, Revek, for your contribution – I really appreciate it. I was not the only one grateful to Revek. I must admit that before the convention I was a little bit afraid how it would go. The last two Polcons were, maybe not very bad, but definitely not good. This year, we saw some communication problems before the con. Moreover the club that ran it will have another big event in two months, Copernicon. I believe I was not the only one who was apprehensive. Fortunately, it was really good. Probably I won’t include it on my list of my favourite Polcons, but I think it was way better than the ones in Wrocław and Lublin. I won’t visit any convention for a few weeks so instead of the next convention report I’ll publish some pictures from my GUFF trip.